Valentine’s Day is the time for a taste of the tail end of Pomegranate season. 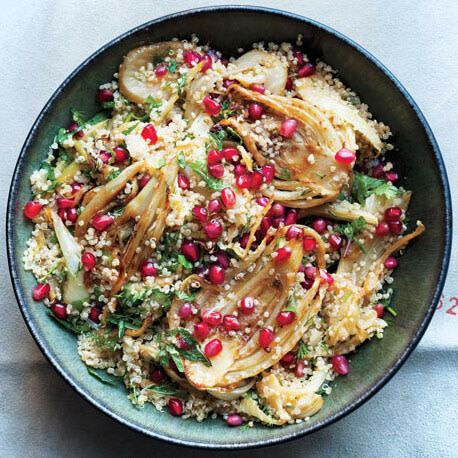 Pomegranate seeds pop color and tang into a quinoa and sauteed fennel salad. Pomegranates are one of those winter fruits that, like citrus, provides juicy, bright-colored and -flavored contrast to the hearty, comforting root vegetables we depend on this time of year. Not that there is anything the slightest bit wrong with turnips, yams, parsnips and potatoes, but their starchy, soft texture and earthy colors lack a certain je ne sais quoi. Or rather, I do know what they lack: juice and color. Pomegranates don’t look like they’d provide that, but they do. You just have to search. Inside a tough-skinned red pomegranate are the seeds – corn kernel-sized rubies that first pop the eyes and then the tastebuds. They’re a great Valentine’s Day treat, the brilliant red of their seeds Hallmark-ready for the holiday of love. And since it takes a bit of work to get to the seeds, you probably see them about as often as you see cupid waiting at the MAX station with his bow and arrow. But like love, the seeds of pomegranates are worth the wait. Cracking open the hard shell of the fruit reveals the seeds (proper name: arils). However, no matter what you call them, the seeds are famously covered with inedible pithy pulp that can be messy and hard to remove. Best to open the fruit in a bowl of water, thus avoiding the mess and allowing the water to bathe the seeds clean; the pulp will rise, the seeds will sink. Middle eastern cuisines often use pomegranate syrup as an accompaniment to lamb or chicken. The syrup, found in middle eastern specialty grocery stores, is also great as a splash of brilliant crimson on vanilla ice cream. But the seeds themselves are always a hit as a sprinkled-on addition to many a green or grain salad. Here’s one to try. Recipe from Yotam Ottolenghi in Bon Appetit magazine.